This weekend I had the honor of hosting a bridal shower for my best friend Alyssa, along with the other bridesmaids! I will be standing by her side as her matron of honor at her January 7th wedding and I couldn't be more excited. Alyssa and I became close while cheering in high school and even closer when we traveled to Southeast Asia together and ended up rooming our freshman year at A&M. 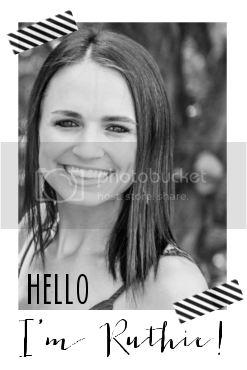 I love scrapbooking and crafting so immediately I knew I wanted to make the invitations. The theme was vintage so I was sure to check out lots of thrift stores (and Goodwills) for decor. I also made buntings and paper rosettes for to add to the theme. I fell in love with the vintage flour, sugar, tea and coffee tins I found at Salvation Army. 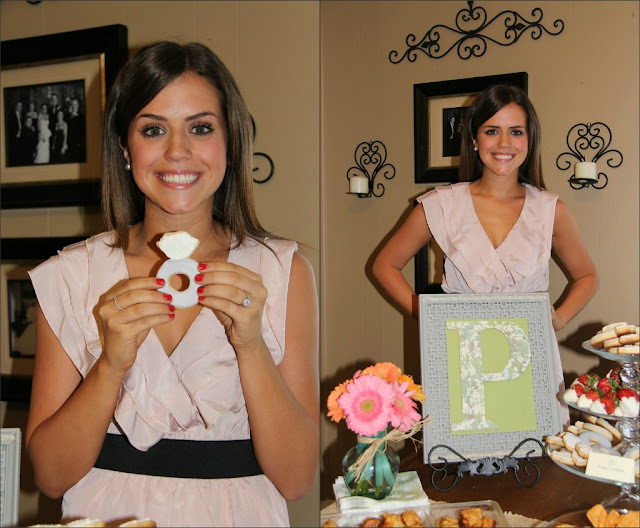 Check out the diamond ring shaped cookies...thank you for the help Leah! Games are my favorite part of any shower and we played 3. 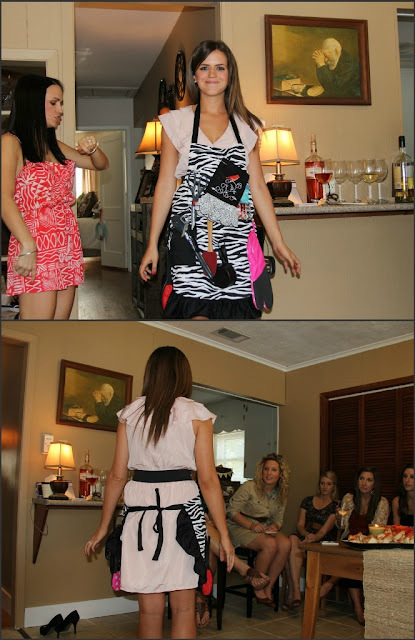 I got the idea from my bridal shower decorated an apron with different kitchen/household items. Alyssa walked into the room full of guests for 1 minute while they tried to memorize the items. The person who wrote down the most correct items (after Alyssa left the room) won a prize! For the second game, I asked Alyssa 15 questions about where her and her future hubby will be in 5 years (example, what is your ideal career, will you have any babies, what will you do to celebrate your 5 year anniversary). The third game was my favorite. 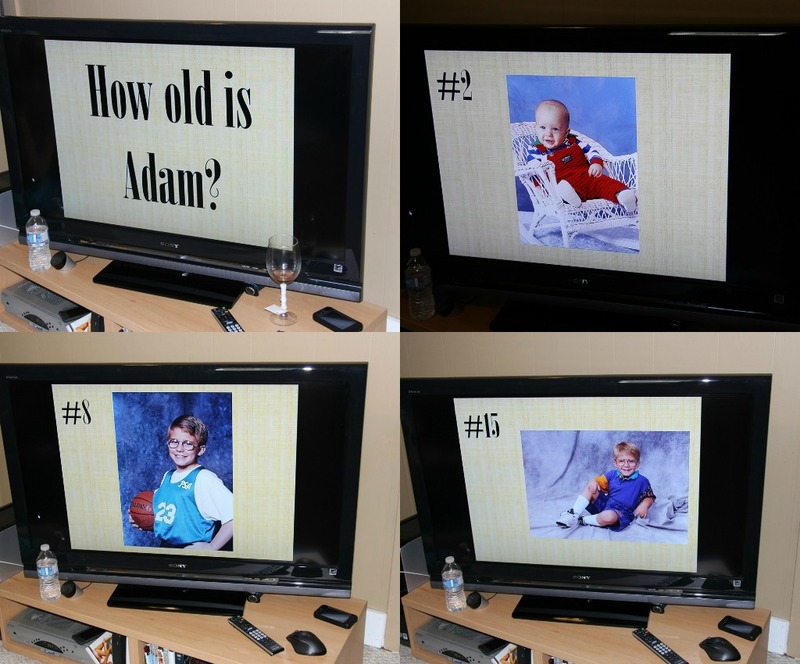 I teamed up with the grooms mom to get photos of him from birth-current and the guests had to guess what age he was (I made a powerpoint). It was hilarious and fun! 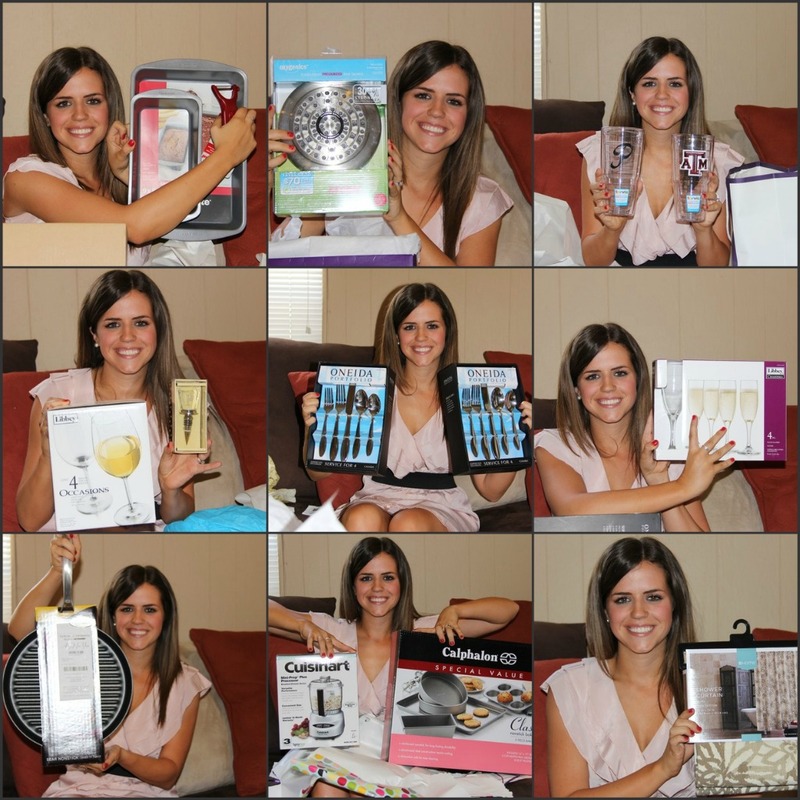 And of course the bride got loads of gifts! My little sister, Tomi, and the bride! Have you ever thrown a bridal shower? I'd love to hear about it! you did such an amazing job with the shower! I love the vintage touches - especially the little calender. so sweet. :] and the games were all very clever. with showers often you end up doing the same things over and over and over again. Whoop! Whoop! 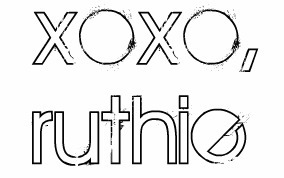 Ruthie, you did an amazing job with this! You should be soooo proud. All the decorations and the awesome goodies she got... all so great! :) And the bridesmaids necklaces are gorgeous. Looks like you did an incredible job Ruthie! Everything looks beautiful and full of love. I've only thrown one bridal shower and it was for my cousin; I remember it being a blast to prepare! This shower is amazing!!! And that necklace is so gorgeous! This is SUCH a cute shower!!! I love it, you did such a good job! I love the games you picked, too. Sounds like it was a blast! what an amazing job you did ruthie!! i love all the details you did, and it looks like an amazing time. congrats to your friend on her upcoming day! Ruthie how cute are you!! I love this! You're way too creative. Girls like you make uncreative girls (such as myself) look awful. And the necklace is beautiful! Can't wait for the dress! Happy almost wedding to your friend!! It turned out great! I love that little frame with their wedding date circled with a heart. Too cute!!! Can't wait to use guess-the-grooms-age at our next shower. And so glad the cookies turned out! So cute! I love the theme! And that food looks AMAZING!! wow! you did an amazing job. i LOVE the vintage theme. and holy smokes, that food looks incredible. and you're sooo pretty Ruthie!! You put on the most amazing shower! Will you do mine? Not that that will happen anytime soon, but you don't an amazing job, Ruthie! You did such a great job on the shower. I LOVED all the details! Thank you so much I loved loved my shower!! You're the best and I can't wait for the Bach party :) miss/love you moh! Beautiful shower!! I have never thrown one but I know where to come when I do!! ruthie you did an AMAZING job! it was beautiful!!! both of you girls are gorgeous. i wish i was half as pretty as either of you! You did an amazing job!! 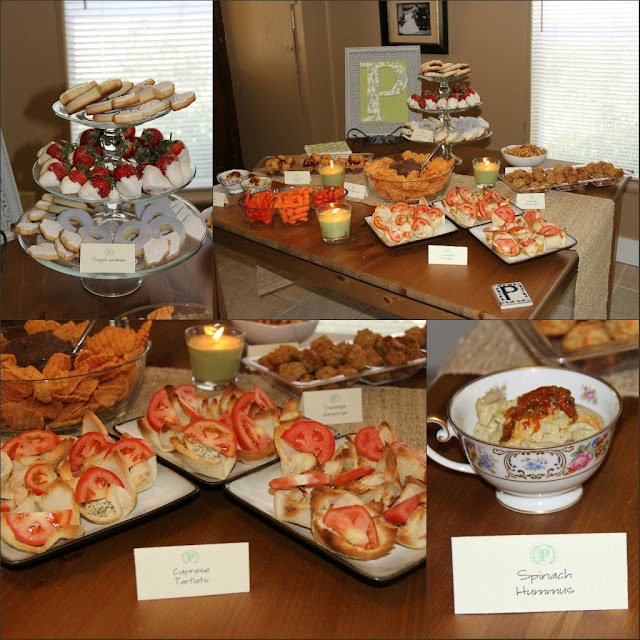 It was like this was you 10th bridal shower it was so good! :) Such a fun moment to spend with a best friend! Ok, I need to comment again..I love this post!! What a fabulous party! Love the decor and the food looks delish! And that necklace is gorgeous ~ can't wait to see the whole ensemble!